ORANGE, Texas--(BUSINESS WIRE)--INVISTA’s site in Orange, Texas, set a 12-month production record for adiponitrile (ADN), a key ingredient for nylon 6,6 plastics and fibers. The performance increases can be attributed to the company’s latest ADN technology, which was developed at INVISTA’s global R&D facilities and piloted at the Orange site where it has been deployed for nearly five years. The technology brings improved product yields, reduced energy consumption, lower greenhouse gas emissions, enhanced process stability and reduced capital intensity, compared to existing technologies. INVISTA is deploying its latest ADN technology in existing facilities and working to optimize production to increase yield even further. INVISTA Orange: Since deployment in 2014, improvements in performance have enabled the Orange facility to set numerous production volume records. Butachimie (INVISTA joint venture with Solvay in France): Announced approval to deploy the latest technology in 2017. The project is scheduled to come online in 2019. INVISTA Victoria: Announced $250 million project at Victoria site to upgrade its manufacturing technology and increase production of ADN. Targeted to come online in 2020. INVISTA recently announced a new world-scale ADN plant that will be located in China. Engineering is underway for a minimum 300,000-ton plant at an estimated investment in excess of $1 billion. Construction is targeted for 2020 and production would begin in 2023. 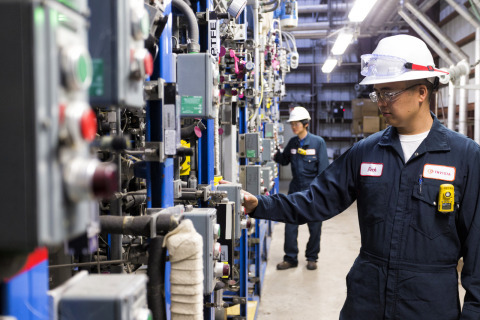 INVISTA’s site in Orange, Texas, set a 12-month production record for adiponitrile (ADN), a key ingredient for nylon 6,6 plastics and fibers.